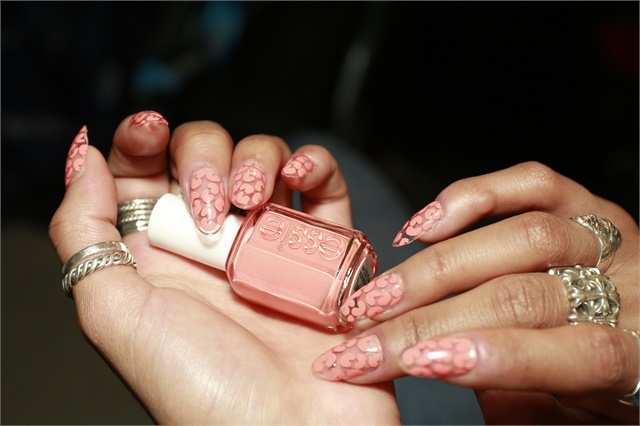 Miss Pop for Essie created a techno animal print design for the Jeremy Scott runway show. 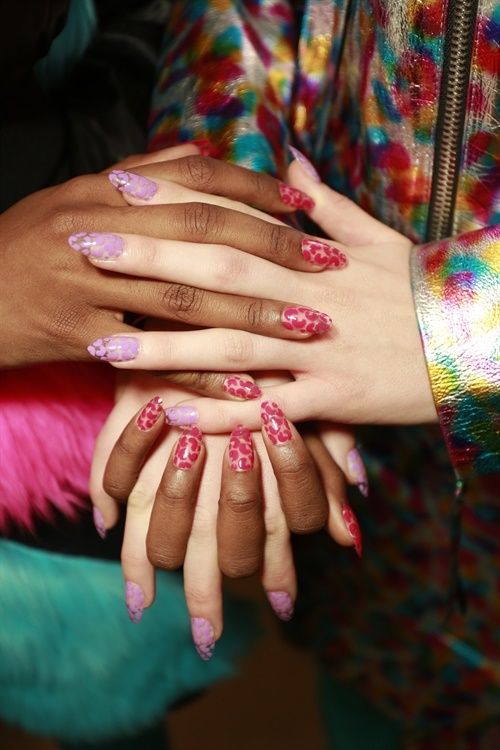 Inspired by the vibrant neon shades found in Jeremy Scott's Fall/Winter 2018 collection, Miss Pop for Essie channeled the designer's raver muse by creating a "cool, techno animal print" on nails. Using three Essie polishes, she produced a playful pattern that's as easy to achieve at home as it is bold and bright. "Try a half macaroni shape or a single dot of color to fill any empty space," she says. 2. Using the brush in the polish bottle, create macaroni-shaped squiggles in various directions all over the nail with Tart Deco (coral), Play Date (lilac), or Bachelorette Bash (fuchsia). 3. Wait a few seconds so that the polish is dry to the touch, then finish with Speed Setter Top Coat for high shine. See more NYFW nail designs in this photo gallery.